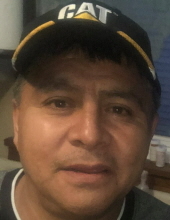 Luis Hugo Medina, 47, of Fostoria, passed away at his home on Wednesday, December 5, 2018. He was born in Mexico City, Mexico, on May 17, 1971, to Luis Lugo and Angelina (Villeda Gonzalez) Medina. He married Nickole Brockschmidt in Fostoria on September 20, 1994, and she survives him. Also surviving, and cherishing his memory, is his son, Luis “Ricky” Enrrique Medina of Perrysburg, and daughter, Presley Ana Medina of Fostoria; mother, Angelina of Mexico City Mexico; siblings, Alicia, Ruben, and Rosa Angelina Medina of Mexico City, Mexico, Alejandro Medina of Fostoria, and Raul Ramirez of Cygnet; and mother-in-law, Judy Amos of Wayne and father-in-law, Robert Brockschmidt of Gibsonburg. Luis was six weeks old when he was taken into the arms of and sheltered by his grandparents, Presciliana Villeda and Adrian Gonzalez, who he loved dearly. His grandparents precede him in death, along with his father Luis. Luis loved his kids more than anything. He was the “best dad ever” and his kids never wanted for anything; he always wanted more for them than what he had. Coming from humble beginnings, Luis was a migrant worker. He was a workhorse and never rested. He worked for 18 years for Seneca Millwork in Fostoria. For the last five years he worked for Morgan Advanced Materials, also in Fostoria. A very good handyman, he could fix anything and would help anyone. He loved garage sales and auctions. Luis was a good cook and put on good parties. He loved soccer, especially Cruz Azul; a lifelong fan of the team. Visitation will be held from 3- 8 pm on Friday, December 7, 2018, at MANN-HARE-HOENING Funeral Home, 407 N. Countyline St., Fostoria. Funeral services will begin in the funeral home on Saturday at 11 am, with an hour of visitation prior to services, Pastor Jerry Copeland, officiating. Burial will follow in Graham Cemetery, Wayne. Memorial contributions may be considered to the Medina family to support the children’s education, or to NAMI (National Alliance on Mental Illness, 1225 Dublin Rd, Ste. 125 Columbus, Ohio 43215). Online expressions of sympathy may be made by visiting www.hoeningfunealhome.com. To send flowers or a remembrance gift to the family of Luis Hugo Medina, please visit our Tribute Store. "Email Address" would like to share the life celebration of Luis Hugo Medina. Click on the "link" to go to share a favorite memory or leave a condolence message for the family.